This is an edited version of a speech I gave at the PNG National Party Convention held on Friday 7 April 2017. It’s a pleasure for me to stand here to address you. It’s an even greater pleasure to be a candidate of this Party and to put my hand up to represent my people and to be a voice and advocate for a greater constituency of our population – women and girls. It is an honour and if elected a responsibility that I will take seriously. 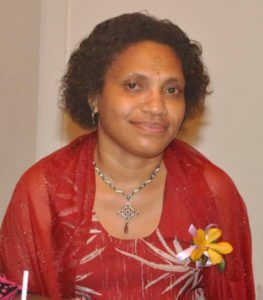 I thank God for the blessings he has bestowed on me in granting me the opportunities that few Papua New Guineans have and so that remains a key goal for me to address the poverty in opportunities that our people have, especially women and girls in rural PNG. I must pay tribute to my late father, William Sawang, who was a leader in my province. He was a politician and Minister in the Madang Provincial Government. He walked the bush trails that I now follow in my campaign and the older generation in my electorate still remember him fondly. I honour my mother, Ninge William, who remains a source of strength and moral guidance for me. My family have played a great role in supporting me in my journey. I acknowledge my precious daughter, Lydia Phoebe, whose love and confidence inspires me to achieve more. I acknowledge too my partner. He is silent and remains in the background but he helps me navigate these, at times, treacherous waters. Finally, I want to acknowledge our Parliamentary Party Leader Hon. Kerenga Kua. I had no shortage of suitors that wanted me to join their political party. Many approached me offering different goodies but only our Party Leader took the time to remain in touch with me and to demonstrate his solid commitment to me and his confidence in me. For that I am grateful. For that I have made the decision to join this humble and esteemed Leader and this party that has a rich history with luminaries such as Sir Thomas Kavali, Sir Iambake Okuk and Paul Pora. I believe that I can contribute meaningfully to this Party. There is a famous quote attributed to Edmund Burke which I want to share with you. “The only thing necessary for the triumph of evil is for good men to do nothing”. When I saw Patrick Pruaitch’s recent denouncement of the O’Neill Government of which his political party, National Alliance, is a key coalition partner it reminds me of the noble actions of our Parliamentary Leader Kerenga Kua. On April 13, 2016, nearly a year ago he resigned from the National Alliance Party when his conscience and his moral compass would not allow him to accept Peter O’Neill and his Government, which he felt was destroying the country, our economy and lowering governance and accountability from acceptable standards. Where was the National Alliance Party’s conscience then? Where was the leadership of Patrick then? When Pruaitch had the authority and power to intervene but refused to then he is equally culpable for sins of O’Neill and his Party. I will start with the key indicator of fiscal management – the level of debt. From there I will then discuss the budget deficit and then touch upon the economy. I’ll walk through what I call the headline issues but from this you will see that it has been an unprecedented scale of financial mismanagement, mistruths and a recklessness that almost seems to be a deliberate sabotaging of the national interest. This is a sad story of failure and the true costs are yet to be revealed. The adjustment required will be painful for our people. As I said I have been selective in the topics I talk about today because of time constraints but the key message is one of a failed government that is driving our proud country to its knees. We see evidence of this already when this Government went cap in hand to the Australian Government to beg for budget support. This disgraceful begging was met with a stern rebuff from the Australian Government. This is a national embarrassment. It is shameful for a country that boasts of 20 billion US dollar LNG project and with another one just around the corner to beg. Let me start with this chart. What is shown is public debt for the years 2002 to 2016. The numbers on the vertical axis show the value of public debt in billions of Kina. I have separated the years with a red box. The years that appear within the red box are the years when Peter O’Neill has been the Prime Minister. You will recall that O’Neill was elected as the acting Prime Minister in a parliamentary vote on 2 August 2011 and was sworn in later on that day by the Governor-General. We should not forget that the Supreme Court of Papua New Guinea on 12 December 2011 found that the removal of Grand Chief Sir Michael Somare from office in August 2011 was unlawful. If law was upheld then the story I will tell now may have been very different. What stands out clearly from the chart is that over the first nine years the level of public debt remained more or less steady. In fact the value at the end of 2002 was 8.4 billion Kina and up until 2011 it did not go higher than that level. So when O’Neill entered the office of the Prime Minister of PNG in 2011 he inherited a public debt level lower than that at 2002. What is so clear if you look at this chart of public debt you can see that it has grown faster over O’Neill’s term than it did in the last term. 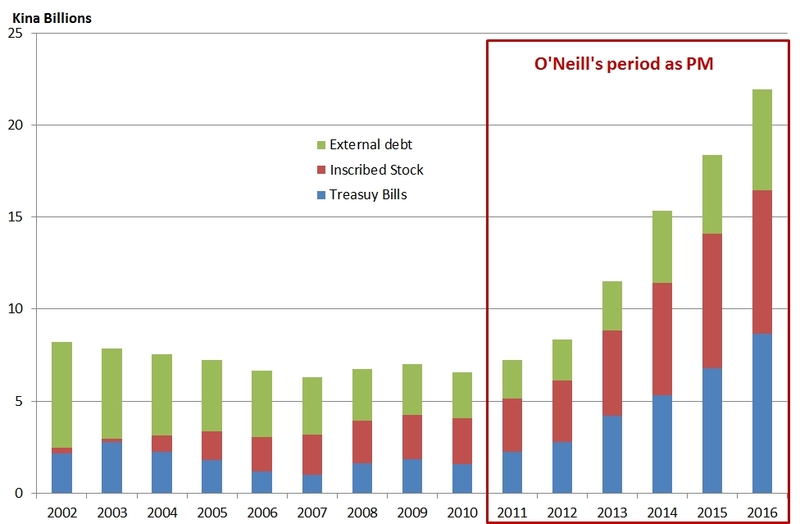 On average, under O’Neill the level of debt has grown by 25% each year. This is an extraordinary growth and is unsustainable – in fact it has brought us closer to a major economic crisis. So what is responsible for driving this growth in public debt? There are a number of factors that can cause public debt to rise but the key driver is the level of the government budget deficit. Generally, a bigger budget deficit leads to a greater need to borrow and this causes the level of debt to rise or dinau lo go antap. Let’s take a look at slide with the level of the deficit. Again you will see that I have placed a red box to mark the years of O’Neill’s Prime Ministership. Again remember that O’Neill became Prime Minister in the previous term of Parliament in August 2011. However, this Government only had time to prepare for the Parliament General Elections the following year and not impose major policy changes. Then with a new Parliament and a new government there was a settling in period so we see that the budget deficit in years 2011 and 2012 were at levels consistent in the immediate preceding years. However, for the years 2013 to 2016 we see an explosion in the size of the deficit. Typically, this numbers are scaled against nominal GDP, that is they are used in ratio where the deficit or debt level is divided by nominal GDP and expressed as a percentage. I haven’t done this because the National Statistical Office (NSO) has engineered a remarkable increase in GDP. An increase that has led to the International Monetary Fund (IMF), an expert on the compilation of GDP statistics and assessment of fiscal frameworks questioning the credibility of the NSO’s new figures. In fact the IMF has published in its last assessment of the PNG economy that the PNG economy is K6.3 billion smaller than projected for this year by the O’Neill Government (see here for a nice analysis by Paul Flanagan). The IMF have also said the O’Neill Government has deceived its economic growth statistics by 5.9% in 2014 and a further 5.2% in 2015. 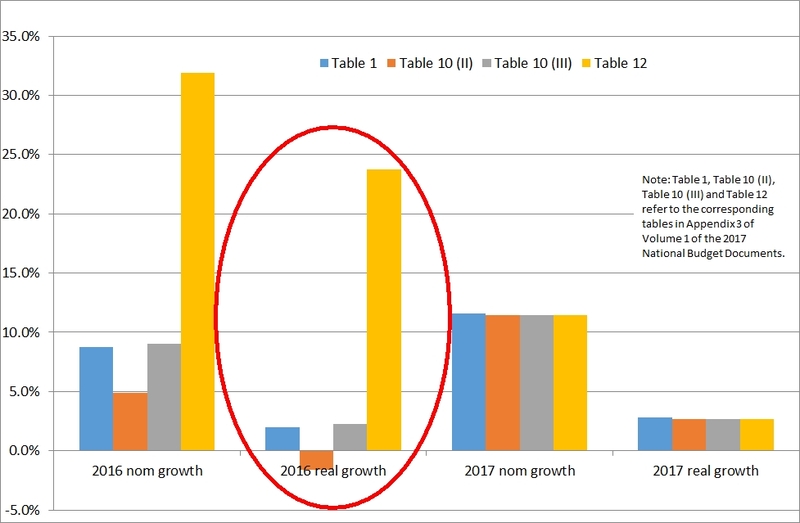 I have done some work and I have computed using only the numbers in the 2017 Budget documents that the O’Neill Government have unwittingly revealed an economic contraction or recession last year (see here). I’ll touch again on this later. The growing gap between public revenue and government spending led to the growth in the budget deficit. As you can see in the chart there was a healthy growth in revenue but this outpaced by the growth in public expenditure. I still recall the O’Neill Government’s boasts about the 2014 National Budget being the largest ever at K15 billion. The warning signs of the fiscal stresses were already emerging. O’Neill and Pruaitch defended the Government’s spending spree believing the good times would not come to end and that the river of gold would continue to float on the fields of gas. Alas the failure of all the planning and work to establish the Sovereign Wealth Fund would validate the repeated caution that savings from resource boom windfall would need to be saved for the inevitable rainy day. The level of development spending ramped up with it being directed to supposed high return capital investments such as transport and sports infrastructure. The O’Neill Government crowed about the size of public investment arguing that the dividends would be realized in higher economic growth. This has not been achieved in the important sectors of the economy outside the extractive resources sectors that our people most rely on. Even the economic policy advisors to Government failed to understand that the fake increase in GDP undermined the revenue story. The base for a tax like GST is the size of the economy and a substantial increase in GDP only serves to further raise red flags about deficiencies in either our tax revenue system or in the administration of that system or both. Of course, we are privileged to have as a National Party candidate one of our statesman Sir Nagora Bogan, whom I worked with on the Tax Review over 2013 to 2015 – he will speak more on this. An increased deficit driving an increased debt level leads to increased interest costs necessary to service that debt. These are funds that can be used to build bridges, to build jetties and wharves, to build roads, to build schools, to build health posts and clinics. When O’Neill became Prime Minsiter in 2011 the interest cost was K461 million. Would anybody like to guess what the interest cost was in 2016? I hear some guesses. Let me give you the exact number from the recently released 2016 Final Budget Outturn Report. It was 1.3 billion Kina. I repeat 1.3 billion Kina. 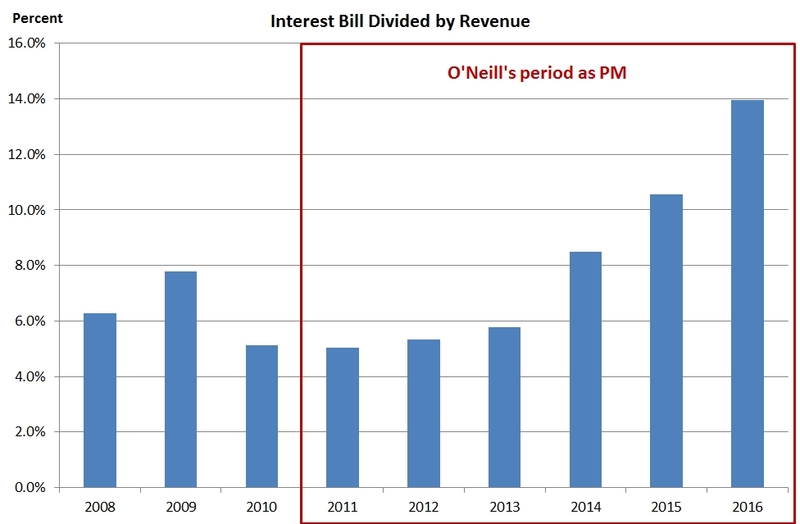 O’Neill’s parting legacy is the gift of nearly tripling the cost of servicing debt from what he started with. Another way of looking at this is to look at different financial ratios. As I explained earlier it would be usual to take the ratio of interest cost to GDP but it may prudent not to do so as the credibility of the NSO statistics and the estimates by Treasury have been critically injured by the IMF’s Article IV report for 2016. So instead I shall look at the ratio of interest costs to revenue (excluding grants). This helps determine the health of the government’s financial position. The ratio of interest cost to revenue shows if the dividends to the increased spending that led to the increased debt as well as the interest cost are being realized in greater revenues for the State. So what you would expect to see in the chart is for the size of the blue bars to fall. The numbers on the vertical axis show the percentage ratio of interest cost to public revenue. In 2011 when O’Neill seized power it was 5%. Instead of the efficiency of the large public investments over his nearly 6 years in power is questioned as the ratio has grown to 14%. The message is clear the public investments are not realizing the growth dividend that was promised by the O’Neill Government. How is Government debt being funded? So where is this borrowing coming from? Or in other words what are the sources of these loans to feed the large and increasing public deficits of the O’Neill Government? From this chart you will see that the green parts show the external loans. Whilst the red strips show the issuance of Inscribed Stock and Treasury Bills within PNG – that is these are domestic borrowings. Inscribed Stocks are loans that have a term to maturity longer than 1 year – they can be as long as 20 years or more if the demand is there. Most inscribed stock have a term of at least 5 or 7 years. Treasury Bills on the other hand have a term to maturity of one year or less. This means that the Government hopes that within that 12 month period the holder of that security decides to repurchase Treasury Bills or that another investor will come in to buy. This then imposes risks that if no refinancing occurs the Government will need to find money to pay out the investor their principal and the interest. It is better for Government to have more borrowing in Inscribed Stock than in Treasury Bills so as to avoid these refinancing challenges. I pointed out in an article an extraordinary breach by the O’Neill Government where it failed to appropriate K9.9 billion in the 2016 Budget (see here). This has still not been corrected. I note that recently the Supreme Court of Justice in relation to Reference No 5 of 2016 on the alleged improper borrowing of Australian dollar 1.2 billion and improper tender and procurement of consultants in relation to the borrowing found that the Ombudsman Commission can investigate conduct of the Prime Minister. There are close similarities between the constitutional breach I pointed out and the improper borrowing of 1.2 Australian dollars from Union Bank of Switzerland. Contrary to the public discussion the key issue is not whether PNG debt to GDP ratio is within 30% but rather whether there is enough liquidity in our financial markets to absorb the huge increase in Treasury Bills and Inscribed Stock. By liquidity I mean sufficient free money by investors that is available to spend on these Government securities without raising the prices of the securities significantly. What this chart shows is how the Bank of Papua New Guinea has bought Treasury Bills (shown in blue) and Inscribed Stock (shown in red). Note that the Central Bank cleared its holding of Treasury Bills in 2004 and maintained this until 2012 when it then recommenced buying Treasury Bills again. Notice too how the total size of the bars (combining both Treasury Bills and Inscribed Stock) remained below 0.5 billion Kina until 2012. I think you are familiar with the story I am telling you. 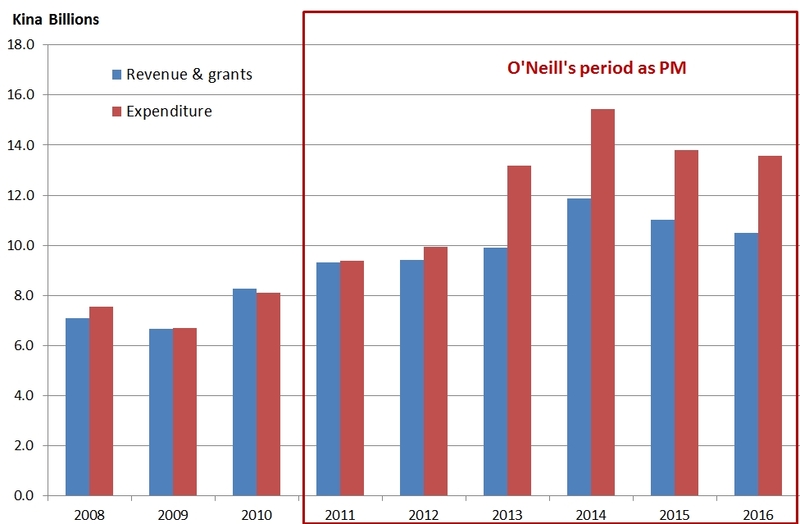 Before O’Neill’s reign the numbers look reasonable but during his tenure as Prime Minister the fiscal position accelerates towards an unsustainable position. So because there were no private sector investors – namely the commercial banks and superannuation funds willing to take up the additional issuances of Government securities (Treasury Bills and Inscribed Stock) the Bank of PNG stepped in to provide funding to the Government. So I ask you – is there are problem with this? The Central Banking Act states that the Bank of PNG may only purchase Treasury Bills and Inscribed Stock for the purposes of monetary policy management. Rather than putting more money into the economy it should be removing this excess money by selling central Bank Bills. I believe that the actions reflect an erosion of the independence of the Bank of PNG and the increasing dominance of the Government and budget over Bank of PNG. This matter has been referred to by a former Governor of the BPNG and former Prime Minister, Sir Mekere Morauta, in public media statements (see here). 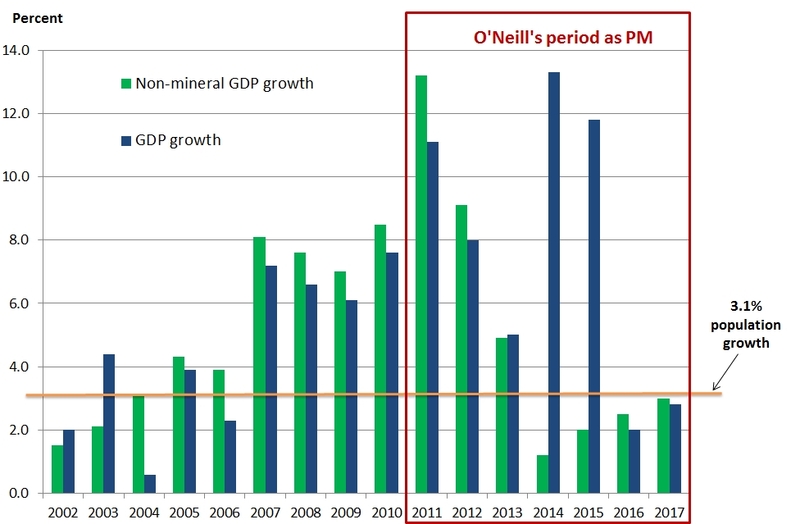 Let me briefly put up the O’Neill Government statistics for economic growth from the various official documents it released including the 2017 National Budget documents. I have the usual red box for O’Neill’s term as Prime Minister. I have also included an orange line that runs horizontally on the chart. This shows the population growth of Papua New Guinea as given by the National Statistical Office. So what do I want to bring your attention to? The blue bars show total economic growth whilst the green bars show only non-mineral and non-petroleum growth. The green bars matter more for our people. The resources sectors are enclave sectors, that is they do not have much interaction with other sectors of the economy apart from during the construction phase. After that the work force requirement shrinks and the production is mainly sold offshore. So let’s concentrate on the profile of the green bars over time. 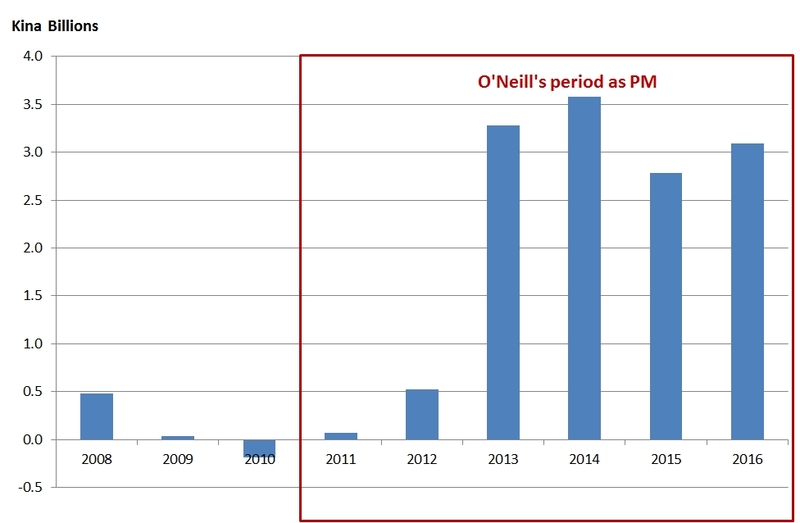 The first thing to note is that it goes up that is it increases over the period before O’Neill enters the PM’s office. 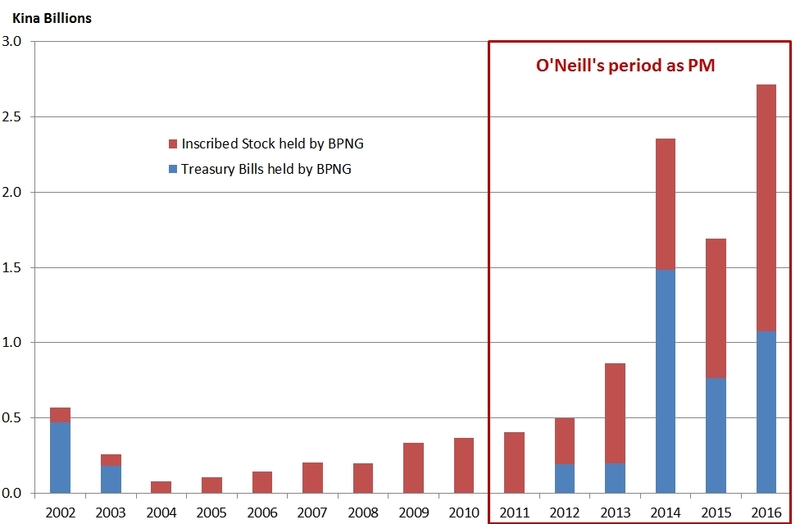 It peaks at its highest level in 2011 the first year of O’Neill’s tenure. After that it falls over three successive years and then never rises above the rate of population growth. It means that income per person or average income for each Papua New Guinean in the non-resource sector (that is the sectors outside mining and petroleum) is falling. So we want to see the green bars (and yes the blue bars too) above the orange horizontal line. Again this shows that the huge so-called investment spending by the current Government has not provided an economic return for our people. Growth has not been inclusive. I thought I’d show you this chart from some work I did (see here). Looking at the O’Neill Government’s estimates for economic growth in 2016 and 2017, what I discovered was that their own numbers revealed unwittingly an economic contraction in 2016. If I direct your attention to the chart within the orange circle I explain in my article on my PNG Woman blog why the orange bar showing an economic contraction is most likely correct on the weight of evidence available. The takeaway message is not to bore with technical details but to demonstrate that the O’Neill government has not been fully transparent and been economically with the truth. President Donald Trump’s successful election run may have seen increased usage of the term “fake news” but it disheartens me to note that perhaps O’Neill was doing it long before Trump became a politician. I’ve given my blog address on the slide, please take a look. I will have more interesting articles coming out including how the Bank of PNG has acted unlawfully and I will also discuss the inequity of the proposed sale of the State’s equity interest in PNG LNG to landowners. This is a damning indictment from Department of Treasury. It seemingly reveals that Treasury’s professional view is that there is significant economic distress contrary to the GDP statistics in the 2017 budget. I also interpret it as veiled criticism of the Bank of PNG’s exchange rate conduct, which has led to foreign exchange rationing and the inability of business to source required inputs overseas for operations as well as for investment. This has led to a difficult business climate with the private sector experiencing lower sales, sitting on capital investments, and even laying off workers to cut costs. This vicious circle will continue until corrective measures are undertaken. The two key economic adjustments needed are: (1) an immediate reduction in the size of the budget deficit but in a manner that protects critical spending on essential goods and services; and (2) the second being the Bank of PNG making changes to the strength of the Kina to remove the excess demand for foreign currency but in an orderly manner. Distinguished Ladies and Gentlemen I thank you for your attention and I thank the Party President for giving me the opportunity to make this presentation. A copy of my edited presentation will be made available on my PNG woman blog. This presentation may look gloomy but I quote our Party Leader Kerenga Kua, who stated in his speech this morning, “Hope is on the way through our Party – the PNG National Party”. May God bless us, our Party, Papua New Guinea and most of all our people. Department of Treasury’s 2016 Final Budget Outturn Report for 2016 statistics available at http://www.treasury.gov.pg (accessed 6 April 2017). 4. What is the party’s proposed sustainable debt level if any debt is being considered? 5. How will the party address FX issue? Thanks for your comment and for the questions. PNG National Party has a designated spokesperson on economic matters and it isn’t me so I can only voice my personal views. You can expect to hear more though from my esteemed Party Leader Hon. Kerenga Kua over the coming weeks and months. One of the hallmarks of my Party is that it is a Party for all Papua New Guineans. It is a Party that is national and that cares about economic fairness and greater opportunities for all our citizens. I would probably need another blog piece to respond comprehensively to the good questions you raise. The first part of the problem is that we don’t really understand how big the fiscal problems are. Increasingly, what we are seeing is that the O’Neill Government is moving transactions off the Central Government balance sheet and hiding them in SOEs for instance – a case in point being the UBS transaction. Also we see that SOEs have given loans to Government but these have been disguised as revenue. We also see media stories of arrears and underfunding. The true picture of our budgetary problems could be very scary. 1. Bring the government budget gradually into balance. In particular the deficit plus interest payments (primary balance) needs to be at least positive and moving towards that goal over time in a sensible manner is paramount. 2. See answer to (1). What is also needed is to restructure the debt portfolio and address some of the risks inherent in the large weighting within the composition of short-term debt. We should also access more concessional finance (determined by the grant element of the loan, which depends on various terms such as grace period, term to maturity as well as the interest rate) – yes it comes with conditions but these help discipline us and ensures we get maximum returns for each Kina borrowed. 3. Government needs to focus on its core functions and step back from spreading its resource too thinly. Setting the correct signals and providing a conducive environment for the private sector to be the engine of growth. I am a big supporter of SMEs and I am especially keen to see more of our people become successful entrepreneurs. Spending on inclusive development is where Government needs to go – let’s make a profound difference right down at the district level. Government doesn’t need to be big – it needs to be smart. We need public funds to go to development projects with the greatest economic returns (note I used economic and not financial) and let’s publish these expected returns so our people have visibility as to where their hard earned Kina goes when taxed. 4. The level of debt over GDP (the debt ratio) is used as a “fiscal anchor” and setting the target sensibly and adhering to it helps stakeholders understand how fiscal policy will behave broadly, it brings a level of certainty and confidence to business, the private sector and investors so they can plan for the medium term and commitments such as investing in new plants, upgrading, new technology, etc that can grow the economy and provide jobs and income for our people. Rethinking the target is necessary. GDP is not a good scaling variable anymore and I would suggest using non-resource GDP to determine the appropriate ratio. 5. The FX issue is a Bank of PNG matter and the independence of the BPNG is respected. The BPNG has been straying from its mandated role of looking after monetary policy matters and is increasingly involved in fiscal matters. I pointed out in my paper that BPNG has adopted an accommodative monetary policy stance and by doing so has allowed the O’Neill Government to spend more than is prudent. There is an excess demand for FX and the market isn’t being allowed to adjust to equilibrate because the BPNG is rationing FX and at the same time setting the FX price (i.e. the exchange rate). Something has to give and sadly it is economic growth despite the false growth estimates being given by O’Neill’s government – our people are paying the price with lost jobs, lowered incomes and less consumer choice. Thank you for the articulated analysis and information on the country’s financial status. Your choice to be with PNG National Party is of a great one too. Hope your party form the next government since your party leader, Hon. Kerenge Kua is one of the few capable and competent leaders who can pull PNG out of this quagmire. Please spread the word that new honest leadership is required and help guide our people to make choices that lead to a better Papua New Guinea for all Papua New Guineans. hi Kessy, I read this with interest one year after you presented this important info. in that one year, nothing has changed for the better. I believe selling bonds in Europe is a bit like throwing out the buai market and replacing it with spak brus market . . if that is how I may describe our desperation, I may be wrong?